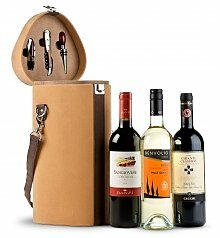 To lift spirits or just because, our thinking of you wine gift baskets are always a pleasure to receive. Sending a gift is an excellent way to let someone know you are thinking of them even though you can't be there in person. 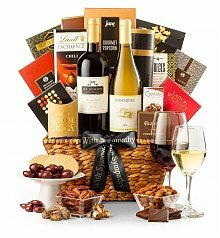 Our thinking of you wine gift baskets are ideal gifts that offer the very finest in gourmet delicacies, sweets, and wine, all in a decorative keepsake container or basket. 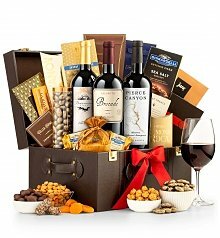 Your feelings and best wishes will be expressed when sending GiftTree thinking of you gift baskets, and with our large selection, you will be able to find just the right gift to express your sentiments. We know it can be difficult to think of thinking of you gifts, and we make it easy for you by offering a variety of thinking of you flowers and thinking of you fruit baskets of the highest quality. Our fruits are the most colorful and ripest of the season and our flowers are always fresh, vibrant, and professionally arranged. 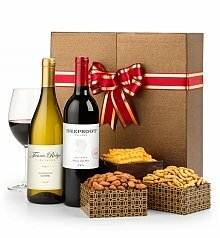 Sending fruit or flowers with thinking of you wine gift baskets is always a good idea. Finding the right expression of your thoughts is important when brainstorming thinking of you gift ideas. If someone needs an uplifting gift along with food and wine, we suggest sending thinking of you balloon bouquets. Their festive designs and cheerful messages will brighten up their day. If you have questions or concerns, however, our customer service team is standing by to help you. We want to make sure that you are satisfied with your choice of gift every time you order.